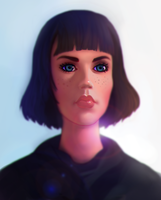 My Photoshop Portrait Painting Tutorial video (46min) is out now! Reminds me a little of Lucy (2014). Nice, looks like the girl from that French movie "amelie"
Does anybody else think she looks like max caufield? From life is strange? I'm in love with your art style! Loved it! And the video on how to make it was so intense with info! I need to study it even more! THis is going to be helpful, thanks ~! Amazing! I love this one. I love all of these faces ! Wooaaahhhh that's a really pretty necklace, it looks real! To me she looks a LOT like the young (even younger, I mean) Scarlett Johansson, although the impression fades a little the more it's zoomed in. That certain look together with those puffy lips, I think combined even with the pretty much exactly right distance between the eyes, it all fits. So, was she a reference or is this pure coincidence? Nicely done. Thank you for the great tutorial, some good advice there. I don't have a tablet, so getting this kind of stuff done is really, really hard... Keep it up! The softness of the shirt...amazing work. This is good but she kind of looks like Taylor Swift with the nose, lips and eyes a bit. you paint beautiful faces! love your lighting! There is someone called Katya Lischina. She's as about as close to the girl in this painting as you can get. Eltrato es muy natural bellisima. I love the way you draw eyes. You draw this girl a lot, is it you, or somebody you know? Just curious. You are such an amazing artist!! So inspiring! !